Ordinarily, solo opera characters never sing in unison; Verdi is making another musical joke by having them all sing the letter together, the mezzos (Meg and Quickly) joining in to thicken the sound as the melody dips toward the bottom of the staff. What a Herod of Jewry is this! O wicked world! One that is well-nigh worn to pieces with age to show himself a young gallant! What an unweighed behavior hath this Flemish drunkard picked--with the devil's name!--out of my conversation, that he dares in this manner assay me? Why, he hath not been thrice in my company! What should I say to him? I was then frugal of my mirth: Heaven forgive me! Why, I'll exhibit a bill in the parliament for the putting down of men. How shall I be revenged on him? for revenged I will be, as sure as his guts are made of puddings. Letter for letter, but that the name of Page and Ford differs! To thy great comfort in this mystery of ill opinions, here's the twin-brother of thy letter: but let thine inherit first; for, I protest, mine never shall. I warrant he hath a thousand of these letters, writ with blank space for different names--sure, more,--and these are of the second edition: he will print them, out of doubt; for he cares not what he puts into the press, when he would put us two. I had rather be a giantess, and lie under Mount Pelion. Well, I will find you twenty lascivious turtles ere one chaste man. Read; perceive how I might be knighted. I shall think the worse of fat men, as long as I have an eye to make difference of men's liking: and yet he would not swear; praised women's modesty; and gave such orderly and well-behaved reproof to all uncomeliness, that I would have sworn his disposition would have gone to the truth of his words; but they do no more adhere and keep place together than the Hundredth Psalm to the tune of 'Green Sleeves.' What tempest, I trow, threw this whale, with so many tuns of oil in his belly, ashore at Windsor? How shall I be revenged on him? I think the best way were to entertain him with hope, till the wicked fire of lust have melted him in his own grease. Did you ever hear the like? 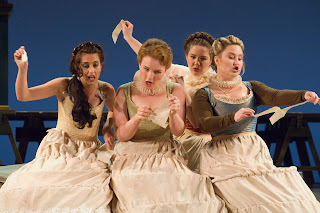 The Merry Wives rip up Falstaff's letter in Seattle Opera's Young Artists Program 2007 Falstaff: l to r Ani Maldjian as Nannetta, Sasha Cooke as Meg, Teresa Herold as Quickly, and Holly Boaz as Alice. Since there isn’t as much Merry Wives material in the opera as in the play, the performers have a little more room to interpret their characters. Says Sasha Cooke, who plays Meg in Seattle Opera’s production, “With a small role like this, you can do anything you want.” Cooke is making her mainstage debut in this production, although she also sang Meg Page in Seattle Opera’s 2007 Young Artists Program Falstaff, at the Meydenbauer Theatre. But she’s not simply bringing her old Meg Page across the lake from Bellevue; Cooke, who has been extremely busy since 2007, has developed as a person and an artist, and so has Meg. In particular, she notes, Meg is extremely mischievous, and really only gets interested in the plot to tease Falstaff when it gets dangerous—-at which point she gets a tremendous kick out of throwing fuel onto the fire. As for Alice, Svetla Vassileva makes her Seattle Opera debut with this production, sharing the role with Seattle Opera favorite Sally Wolf. According to Vassileva, Alice is at first flattered by Falstaff’s letter, only to become a bit crestfallen when she realizes that he sent the exact same letter to Meg, as well. Vassileva has played Alice in several previous productions, and likes the spirit of fun among her Seattle colleagues. In some productions, she notes, the wives treat Mistress Quickly as their servant, lower-class, as she is in Shakespeare; but Vassileva prefers the idea that they’re a bunch of friends, equals, seizing the opportunity Falstaff has provided for them to have an extremely entertaining day. I cannot wait to see my first performance of Falstaff at Seattle Opera. I've always wanted to see a performance, but I have neverhad the opportunity! Did you know that two of your former young artists are currently featured on the site "barihunks" today? Our Young Artists Program is excited about the two baritones mentioned on that blog singing locally: Joshua Jeremiah (who sang Falstaff in the YAP '07 production) as Silvio in PAGLIACCI with Spokane Opera, Tom Forde (who sang Snug/Lion in the YAP '09 MIDUSUMMER NIGHT'S DREAM) as Figaro with Tacoma Opera. And you'll hear some of the barihunks of tomorrow in this year's YAP production, coming up soon at Seattle Opera: ARIADNE AUF NAXOS!